There is nothing more comforting than a good bowl of soup! 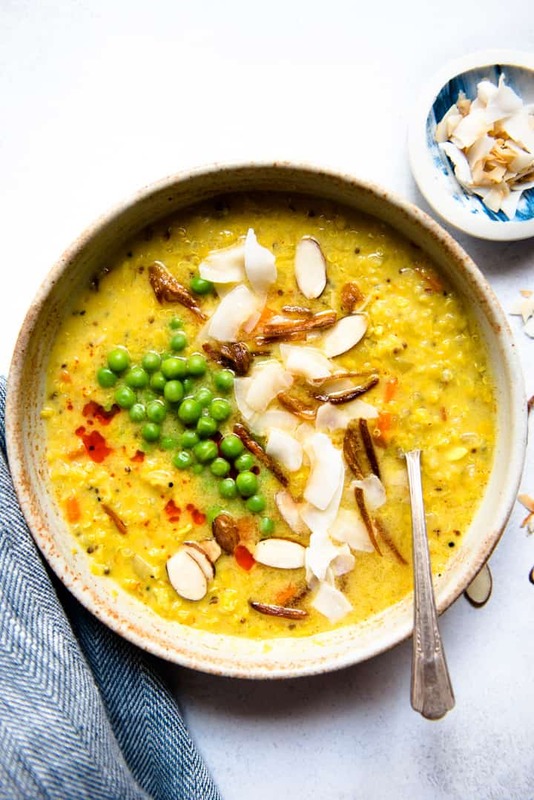 This one-pot red lentil soup gets rich and creamy flavors from coconut milk and it is packed with flavor. You can swap out any of the vegetables for anything that you have on hand. The red lentil soup is even better the next day! When I flipped through Christopher Kimball’s Milk Street cookbook weeks ago, his spicy red lentil stew immediately grabbed my attention. The stew is heavy on coconut flavor, which I love in my soups. I could feel my mouth water as I stared at the photo of the rich, creamy yellow broth. The stew was influenced by Indian cuisine, Goan cuisine in particular, and it was delicious. 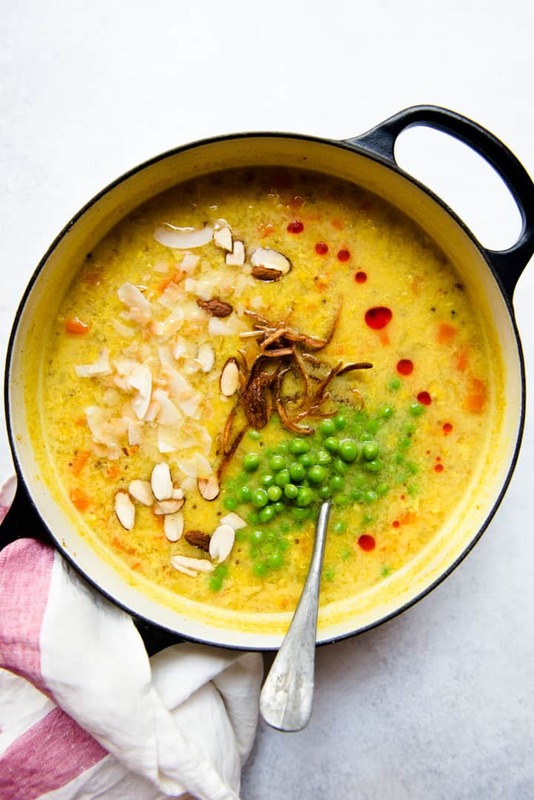 I loved the creaminess of the red lentils and coconut as well as the blend of spices he used. I have made the soup several times and modified the original recipe in several ways. One big change is that I used much less coconut milk: I used 3/4 cup instead of an entire 14-ounce can. Although full-fat coconut milk imparts great flavor and gives richness to a dish, I don’t want a weeknight dish to be too heavy. I also added some quinoa to make the red lentil soup more of a balanced meal. In addition, I changed the vegetables in the recipe, and altered the cooking process in the beginning. Finally, I doubled the amount of red pepper flakes in the recipe because I could barely detect any heat in the original recipe. Don’t worry, the heat should not be overwhelming here! Can you substitute any of the spices? If the spices listed below are not easily accessible, I recommend using a mild yellow curry powder instead of the dried spices. Often times, yellow curry spice blends include those spices anyway. I would use at least a tablespoon of the yellow curry powder and add more if needed. Can I use another grain? Yes, but make sure to use a grain that cooks in roughly 30 minutes, such as white rice, bulgur wheat, or millet. I LOVE the leftovers of the red lentil soup. The soup will thicken the next day. I reheated leftover soup and poured it over cooked bulgur like a sauce. The bulgur tasted amazing with a side of baked salmon. You can swap the salmon for any protein you prefer, such as tofu, chickpeas, or chicken. Although the red lentil soup takes 50 minutes to make, the majority of it is inactive cooking time. 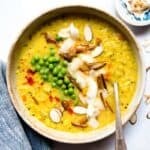 You’ll definitely want to eat the leftovers of this red lentil soup because they taste even better than the day before. The flavor of the spices continue to develop overnight. I also love adding crunchy bits to my soup, which is why I added toasted coconut, almonds, and fried shallots. Feel free to leave any of them out if you do not have them on hand. Heat the olive oil in a large pot over medium heat. Add the onions and cook them for about 5 minutes, stirring frequently to keep the onions from burning. Next, add the ginger, garlic, and carrots and stir for another minute. Add the salt, mustard seeds, turmeric, red pepper flakes, coriander, and fennel. Stir to coat the vegetables with the spices. Add the red lentils, quinoa and 5 cups of water. Save the remaining 1/2 cup of water for later. Increase the heat to medium high and bring the water to boil. Reduce the heat to low, and simmer the lentils and quinoa for 30 minutes, covered. You want this to be a low simmer, so you may want to transfer the pot to a smaller burner. Uncover the pot and stir in the peas, remaining water, coconut milk, and lime juice. Turn off the heat and taste the soup. Adjust the seasonings, adding more salt if necessary. Transfer the soup to bowls and top with toasted coconut flakes, sliced almonds, fried shallots, and chili oil, if desired. I recommend rinsing the red lentils just before you add them to the pot. The lentils tend to clump up very easily. If you rinse them ahead, you will probably end up with a large block of red lentils, though they will separate during the cooking process. Hi Lisa, this sounds great, I intend to try it soon. But I am thinking of using a light chicken stock in lieu of water & adding a bit of ground cumin & a few small red Serrano or Thai bird peppers for a bit more heat. Also some cilantro at the end. Whattya think? I haven’t seen chris’ recipe, but curious about his take on it. Love your idea of toasted almonds. Thanks! Hi, Paul – all of your suggested modifications are great!! The original recipe didn’t use broth, which I was surprised about, but I think they opted for water and coconut milk because they wanted the soup to be a nice bright yellow color (and possibly to keep the recipe vegan). I love cooking with Thai chili peppers, and I usually use 3 for a little bit of heat. I don’t know what your heat tolerance is, but feel free to add more or less! Let me know how it all goes! This looks absolutely delicious, especially with the almond! Will definitely try this recipe! This recipe is delicious – can’t wait to try some of your others!